More painting! As you've probably noticed, I like having a variety of models in my army. Well, here's 2 more! Firstly, a Thrullg! 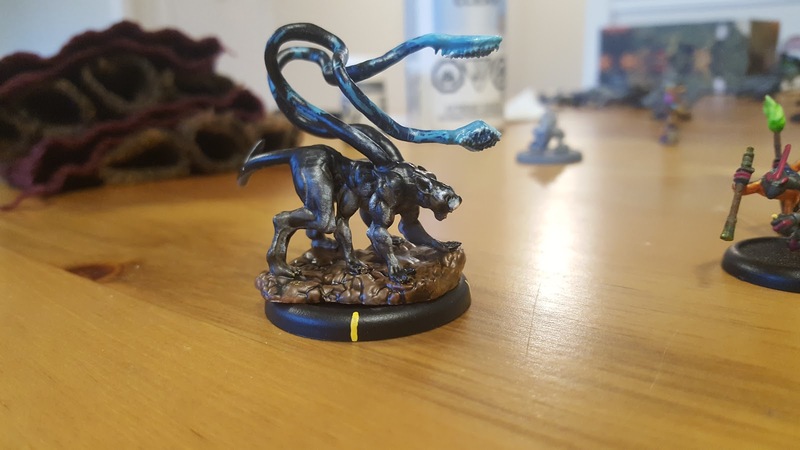 I mean, a Displacer Beast! They both have tentacles, and claws, and I did my best to paint him like Sarah's cat, Reggie! I'm pretty happy with the messy paint job, and he's got the whitest kitty cheeks! I'll definitely pick up a regular Thrullg eventually, but I wanted to get one now and the model was only the cost of a beer. 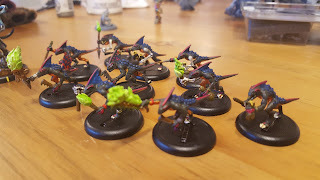 Next up - Croak Raiders! I've always loved how Lizardman tribe for Warhammer fantasy looks, and when a buddy offered me some of his unpainted Skinks, I decided to take the plunge! I've modified them a bit - They have torches, which I added with greenstuff. I also made some bags for them to hold! See, I know the regular raiders have Torches and Oil Gourds, but I decided to go another direction - Sure, they have torches - And they also have flammable spit! They shoot it at enemies with their blowguns, and they save the extra spit in their little goonbags for when they need to have rapid volleys. 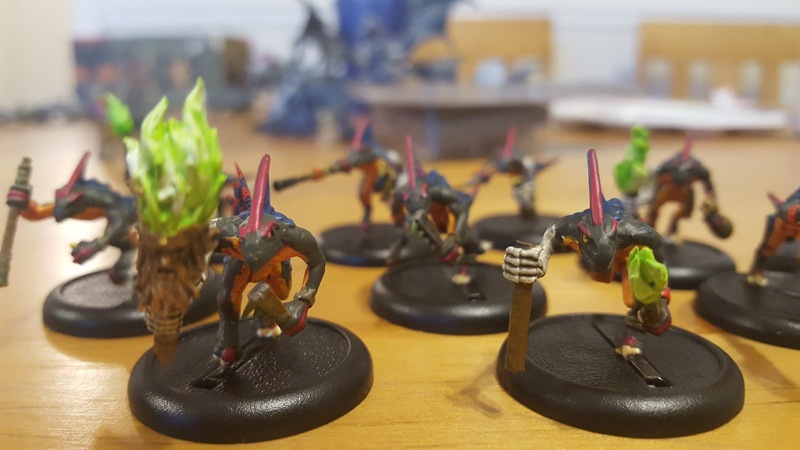 I thought this would be a fun and flavourful way to use the Skink blowguns, and keep the rules accurate! 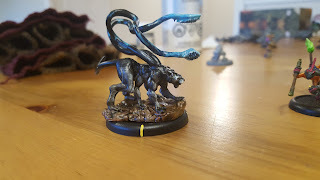 Well, tomorrow I'm doing Day 1 of the Vengeful Deeds Narrative League, at a different store - Since Connections isn't running it. Might even be trying Company of Iron for the first time! Look forward to the reports!